As Costa Rican Latter-day Saints embrace the gospel and hold to its truths, they rise up to meet the destiny promised to them. Luís and Julieta Chaverri’s first baby died from a fever, so it is easy to understand why the Chaverris were worried when 18 months later their second baby also became ill with a fever. The day was 25 February 1974. But this day was also the day that Luís was scheduled to make the two-hour bus ride from Turrialba to San José to be baptized. The missionaries watched as Julieta wept and begged an anguished Luís not to go. She pleaded, “What if our son dies while you are away?” The missionaries responded gently, “Let us bless your baby before we go.” Julieta agreed, and the feverish baby was blessed. Luís felt peace, but Julieta stood weeping with the sick baby in her arms. Six hours later, newly baptized Luís and the missionaries returned. Julieta ran to meet them. “She was crying,” remembers Brother Chaverri, now president of the San José Costa Rica Los Yoses Stake. “She grabbed me by the shirt and pulled me to my knees. I thought our baby had died. Instead, she said that our son had been healed immediately after we left and that we must thank God.” Overflowing with gratitude, they knelt together on the dirt road and gave thanks. Stories of families like the Chaverris abound in Costa Rica. In many towns and cities there are “pioneer” families who have embraced the gospel and applied its power in their lives. Branches grow up around these families, and the number of faithful, committed Latter-day Saints increases. The result is committed temple attendance, strengthened priesthood leadership, and renewed Church activity. The countries of Central America, including Costa Rica, are doing just that. Known locally as the “Jardín de Paz y Democracia” [Garden of Peace and Democracy], Costa Rica provides a tranquil setting in which the gospel can grow. A surprisingly European-like country, Costa Rica enjoys a high standard of living. Native Costa Ricans, nicknamed ticos, enjoy gallo pinto [rice and beans] as their diet mainstay. Seventy-five percent of the more than 3,300,000 residents live in the capital city of San José, located in the central mountains where the elevation keeps this city cooler than cities along its Caribbean or Pacific shores. To the east and south of San José, rain forests dominate the landscape. Banana trees thrive in the humidity. To the west and north, the land is used for grazing cattle and for growing melons. The Pacific beaches are among the most exquisite in the world. From the air, Costa Rica looks as if a great patchwork quilt has been draped over its mountains. Irregularly shaped patches pick up their design and color from the red-tile-roofed buildings of rural towns, the brown earth of plowed fields, and the vibrant green of native foliage. Meandering rivers and winding roads run like stitching around these patches of land. 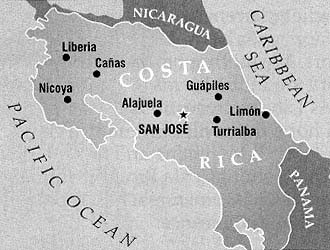 The Spanish claimed this land in 1502 and named it Costa Rica (rich coast) before they realized that its riches were not gold and silver but fertile soil. Oxcarts provided transportation for centuries in this land. The air, then as now, was filled with the calling of toucans and parrots as well as with the fragrance of flowering trees. More than 1,200 varieties of orchids flourish in the warm humidity. Early Costa Ricans transferred the exotic patterns and colors around them into kaleidoscopic designs painted on solid-wood oxcart wheels﻿—still considered a treasured art form. The arrival of the Church here occurred just prior to Costa Rica’s 1948 revolution, which established political stability. H. Clark Fails of Utah, who served in the U.S. Embassy in San José from 1943 to 1946, conducted the first Church meetings in his home. Two months after Costa Rica became part of the Mexican Mission in July 1946, two missionaries arrived in San José. Central America became a mission in 1952, and the Costa Rica Mission was created in 1974. Church membership grew from 214 in 1960 to 1,700 in 1970, and the first stake was created in 1977. In August 1992, Elder Boyd K. Packer of the Quorum of the Twelve Apostles dedicated the land of Costa Rica. Today four stakes, six districts, and 23,000 Latter-day Saints reflect the steady growth in this land during the past two decades. In Costa Rica, as throughout the Church, temple attendance anchors the gospel. Most of today’s leaders can be linked to one of the early temple trips. Misael and Maria Alfaro of Alajuela, a part of the greater San José area, remember the January 1976 trip to the Arizona Temple. Eighty-four Latter-day Saints, including 46 from Costa Rica, made the 8,000-mile round-trip by bus. The Alfaros, who had been baptized in 1956, took all eight of their children. A short time before they were to leave, Brother Alfaro lost the money he had saved for the trip. When he told his wife, they wept, then prayed for help to raise the needed money. A shoemaker, Brother Alfaro took all of his handmade shoes to a neighboring town and sold them for whatever he could get. When he returned home, still short of the needed amount, he sold his car. Today Latter-day Saints still willingly make the sacrifice to receive their temple blessings. Dennis Guillen and his wife, Rosa, of the Caribbean coastal city of Limón are the parents of 11 children. Born in Nicaragua, Brother Guillen sells snow cones, fried chicken, and fried bananas from a small stand across the street from the hospital. Three of his daughters have served missions. Now the family is saving money to attend the Guatemala City Temple. Asked how he earned enough money for three missions, and now the temple, Brother Guillen pauses. Tears form in his eyes and his voice trembles as he says slowly, “Trabajé duro. [I worked hard.] Trabajé duro. Entonces poco a poco. [Then little by little.] Poco a poco.” His words stop, but not his tears. For the Ricardo Díaz family of San José, covenants and sealings made in the Arizona Temple in 1977 have brought comfort and understanding in the face of tragedy. In February 1995, son Geovanny, age 16, drowned off one of Costa Rica’s northern Pacific-shore beaches. Max and Federico Ureña, brothers who live in the San José La Paz stake, are proof of President Alfaro’s belief. Both are returned missionaries﻿—Max, from Honduras, and Federico, from Nicaragua. Their priesthood leadership was needed immediately upon their return. Max was called to serve on the stake high council, and Federico as stake mission president. When Max and Federico were teenagers, their mother got up at 4:00 A.M. each morning to teach seminary. Her sons were her only students. Max acknowledges the truth of his mother’s words. “Seminary and the support of my parents were the two most important things in my preparation for a mission,” he says. Federico agrees. But unlike Max, who always wanted to serve a mission, Federico didn’t decide to go on a mission until he was 18. “I finally committed to put God over everything,” he says. Now both share their testimonies with the youth. Branches in the areas outside San José are, for the most part, still first-generation congregations with few Melchizedek Priesthood leaders. La Rita Branch president Carlos Soto is actually a member of the neighboring Guápiles Ward. In Liberia, the families of the four Méndez sisters, who were among the first to be baptized there, form the backbone of both branches. In some areas, like Santa Cruz, a missionary serves as branch president. The Spirit is strong in these small branches, where members feel unity as they rely upon one another. For example, there are several small, close-knit branches in the city of Limón. Unique because of its large Jamaican and Chinese populations, Limón is bordered by the Caribbean on one side and a great rain forest on the other. The city streets and buildings still bear visible reminders of a severe earthquake in 1991, and nearby the upheaval replaced sandy beaches with sharp coral reefs. But for Latter-day Saints living here, the gospel provides a firm foundation of stability and peace. Services held in the Cristóbal Colón Branch start promptly at 9:00 A.M. with the 50 members singing all verses of the opening song a cappella. Two deacons in white shirts and ties pass the sacrament with respect. The talks are given with conviction from the scriptures, and members read along in their own standard works. One speaker, branch president Julián Alvarez, tells of an experience he had on his father’s banana farm near Panama. “Once when I was cutting bananas with a large machete,” he says, “I cut two of my fingers. These cuts caused me much pain and suffering, but they soon became a constant reminder of the pain Christ suffered for me.” As President Alvarez finishes, he bears his testimony with great emotion of the Atonement and of his gratitude for the Savior. While some families enjoy the blessing of a father who holds and honors the priesthood, other families are drawn together by a believing mother. Zoreida Marchena and Frances Urbina represent the wide spectrum of faithful Latter-day Saint sisters in Costa Rica. Sister Marchena and her seven children were among the early members in Nicoya. In 1979 the missionaries were transferred away from this small town. “These were hard years for us,” says Sister Marchena. “Our branch did not survive. As the years passed, some, including my older children, joined other churches, and they begged me to attend. I refused. I always knew the missionaries would come back and we could attend the true church again. “Each night at bedtime, I gathered my young children around me. I had only my scriptures and a hymnbook. We would sing songs together so we would not forget them. My youngest son, Alex, loved, ‘We Are All Enlisted’ (Hymns, no. 250). Then I would read the Book of Mormon to my children, and we would pray. We carried on this way for nearly 10 years. Today a new brick chapel stands on the main street. Sister Marchena is lovingly referred to as the “mother” of the branch, and her son Alex is serving a mission in Ecuador. Like Sister Marchena, Frances Urbina of San José shares her faithful commitment to the gospel with her family. Well-educated and part of an influential Nicaraguan family, Frances came to Costa Rica in 1979. She found work as a Spanish-English translator for government leaders. Divorced with three children, she learned of the gospel through a Latter-day Saint friend of her daughter Tania. Sister Marchena and Sister Urbina are not alone. Throughout Costa Rica, the influence of faithful Latter-day Saint women reaches into the next generation and makes a difference. Fields here are often divided by “living fences,” so called because they are a combination of living trees and dead sticks. However, in this lush climate, the seemingly dead sticks sometimes take root and grow into bushes and trees. Other members, however, have pulled away from the Church for various reasons. But these less-active members, like the seemingly dead sticks, can spring back to life. The Gilberto Ríos family members are examples of the amazing potential lying dormant within less-active members. Baptized in 1974, they were stalwart members of the Don Bosco Ward for many years. “I don’t know why we stopped coming to church,” says Brother Ríos. “It was as if Satan lifted us up, gave us a taste of the world, and we stayed there.” But home teacher Juan Ramón Obando didn’t forget the Ríos family. For the next 11 years he visited them regularly. That was a turning point for the Ríos family. Brother Obando arranged for the missionaries to teach them. Many friends and family members gathered in February 1995 for the baptism of these five young men ages 12 through 16. Missionaries, not much older than the boys, shared wide smiles, tears, and abrazos [hugs] with each boy after he was baptized. At the testimony meeting that followed, each new member bore his testimony. “We are so grateful to have each other and the gospel,” says Harold. Others shared their testimonies, including the Young Men president, who said to the five boys, “We will help you learn your priesthood responsibilities. We will help you go on missions.” Today the oldest of these five boys is serving a mission, and the other four are leaders in their priesthood quorums. Robert Flores, president of the La Sabana stake, recognizes the value of unity among the stakes. “We are pulling together, and unity brings results,” he says. As promised by a prophet, the Costa Rican Saints are rising up in majesty and strength toward their ultimate destiny. The peaceful town of Cañas sits within the view of two volcanoes. A plaza in the center of town, with its grass, trees, and benches, provides shade and a place for residents to visit. Arthur and Bonnie Johnson, from Kaysville, Utah, are serving part of their 18-month mission in Cañas. They live in a boardinghouse where they have their own bedroom but share the kitchen, bathroom, dining room, and living room with other residents. On one of the dining room walls, the Johnsons have hung a picture of the Guatemala City Temple. They also have the plan of salvation charted out on the wall using colored circles and rectangles. Sister Johnson, a nurse, is still learning to speak Spanish, yet she teaches the little girls in town how to make paper dolls and the women how to make dulces [sweets]. For example, when the Johnsons arrived in Cañas in early 1996, their landlords, Wilburth and Odilie Romero Barquero, asked Brother Johnson to give their son Bernardo a priesthood blessing. Bernardo, who is 20 years old, was born with cerebral palsy and other disabilities, yet he has the joyful innocence of a two-year-old. The Barqueros, though less active, believe in the power of the priesthood. They wanted a blessing for their son that he would be able to walk without help and that he would not fall and hurt himself. Brother Johnson asked two missionaries, Elder Brandon Christensen and Elder Nathan Tyler, to join him. Bernardo received an administration of the priesthood, and two weeks later he took his first steps alone. Above: Sunset in the mountains above San José; background: San José landscape; foreground: David and Marisol Romero with daughter Marisol, back row, with daughters Alicia, Laura, and Daniela, front. La Rita Branch president Carlos Soto, left, owns a hardware store in Guápiles; background: Seagulls soar over one of Costa Rica’s many beaches; right top: Typically, homes are swept clean and surrounded with flowers; right center: Misael and Maria Alfaro with three of their 10 children﻿—Alberto (left), Andres, and David; below: Federico and Max Ureña. Below: One-hundred-year-old Isolima Alvarado finds joy in the gospel; background: Costa Rica’s national flower﻿—the orchid; inset, above left: One of the many “living fences” of Costa Rica; inset: Anayancy Sánchez and Claudia Ríos of the Los Yoses Ward in San José. Bonnie and Arthur Johnson serve in Cañas. Here they teach the plan of salvation. Linda Elizondo and her daughter, Melissa. For 25 years Sister Elizondo has been a gospel mainstay in the Santa Cruz area. Second-generation Latter-day Saints, such as these Primary children, are common in San José.